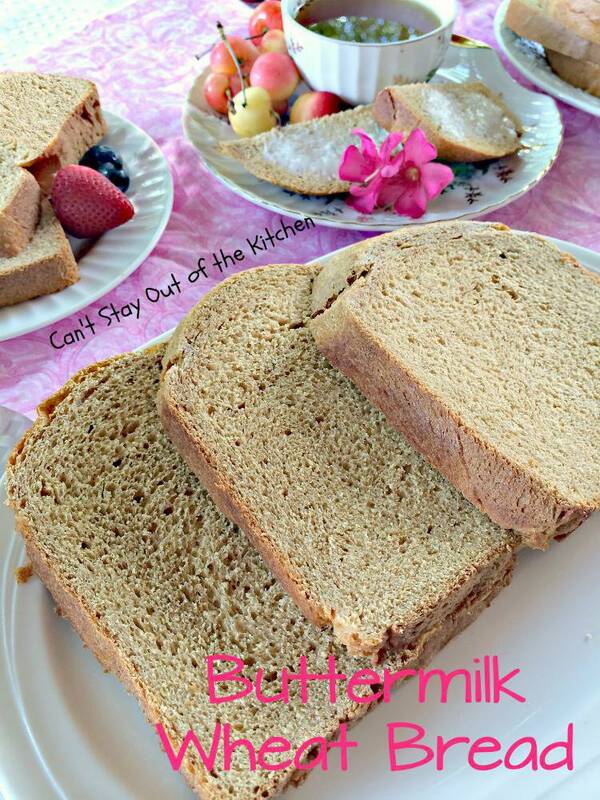 Buttermilk Wheat Bread is a delightful, scrumptious bread recipe from my Black and Decker Bread Maker recipe book. This is the book they give you when the bread maker is purchased. 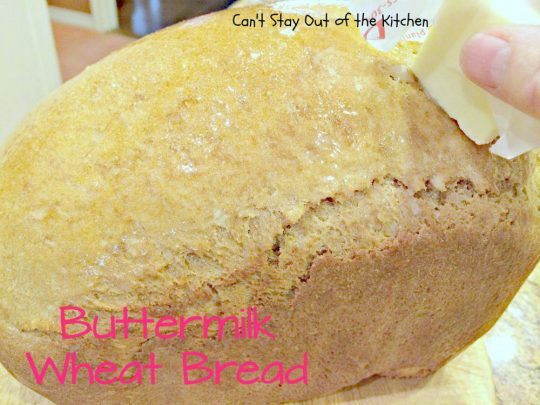 It’s a delicious and satisfying bread recipe that’s super easy to make since you use the bread maker. 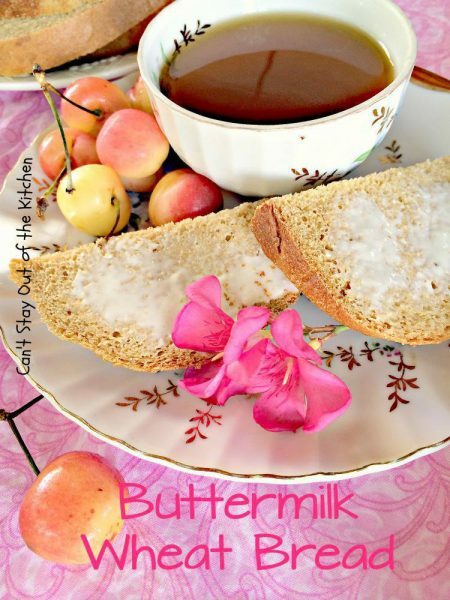 Spread a little butter on it and enjoy it with a tall glass of milk, a bowl of hot stew or chowder, or serve alongside any main course. I don’t usually have buttermilk on hand so I make my own by measuring the milk into a glass measuring cup and adding 2-3 tbsp. white vinegar. As it sits on the counter for 5 minutes or so, it curdles and sours becoming useable for this or any other recipe calling for buttermilk. This bread has wonderful flavors. I’ve even tried it with honey and molasses and it is richer still. It’s a great dinner bread but I also like it for toast with jam spread across it. I have fiddled with the recipe a lot and provide two options for you here. I have made it both ways. One uses all whole wheat with honey and molasses and the other follows the original recipe pretty closely. I do recommend that if you’re not allergic to gluten that you add up to 4 teaspoons vital wheat gluten to the bread when adding the yeast so that it raises better. Otherwise, it’s a very dense, compact loaf and not as light and fluffy as it can be. 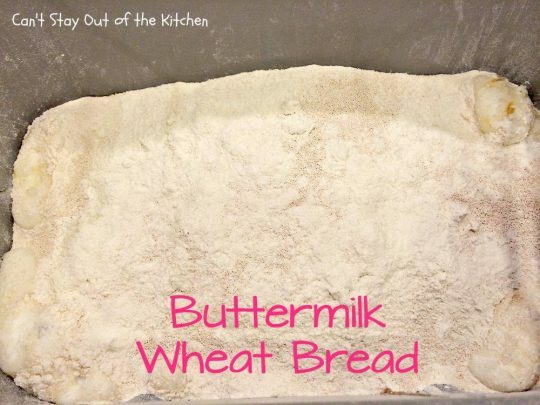 If you use the original recipe you will need 2 teaspoons of vital wheat gluten and if you use all wheat flour you will need 4 teaspoons of vital wheat gluten. This recipe is for a 2-lb. bread maker. 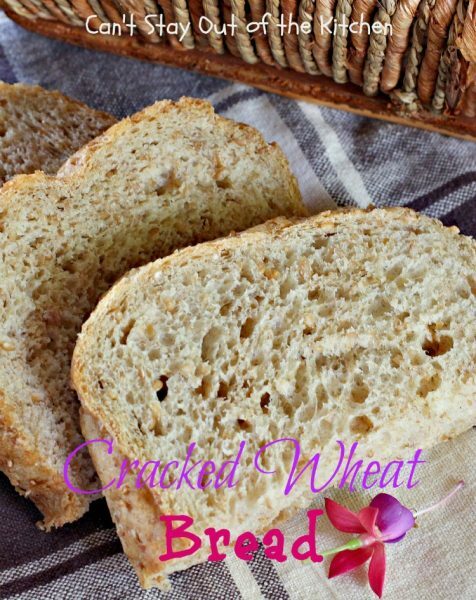 If you’re looking for a delicious and easy bread recipe for family dinners or company, then consider this tasty bread the next time you are planning your menus. 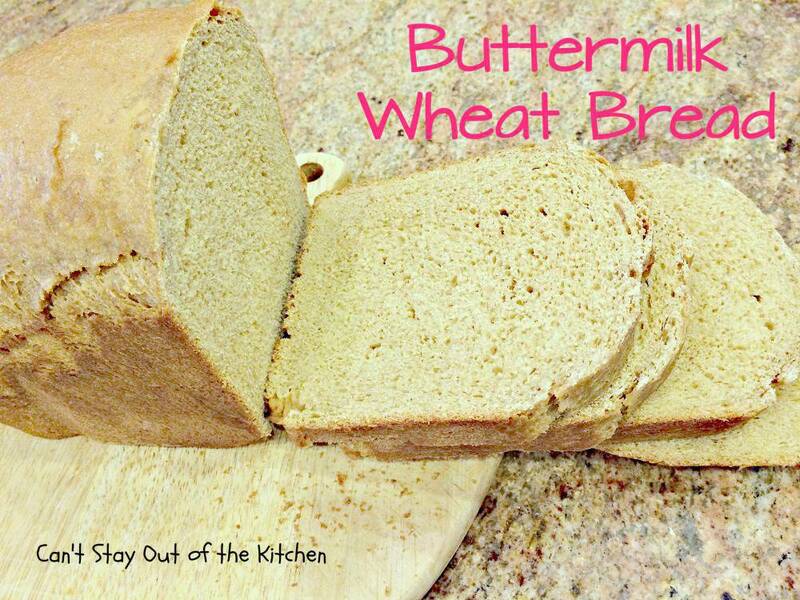 I make this Buttermilk Wheat Bread recipe all the time, especially when I’m taking meals to friends. I recently remade this recipe and took some fresh pictures in better lighting which increased the ability for the viewer to see how tasty this bread is supposed to turn out. This is a truly whole wheat bread with no bread flour–only whole wheat flour in the recipe. 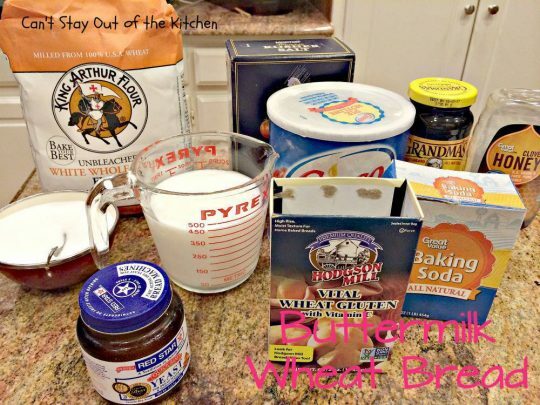 To make this recipe even healthier, omit the sugar and use oil in place of the shortening in the recipe. 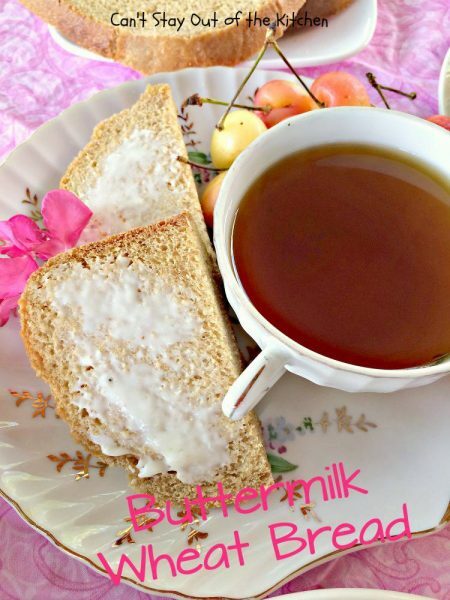 Buttermilk Wheat Bread is a great dinner bread recipe–although I enjoy this for breakfast by spreading my toast with jam! Here’s a piece of the bread with butter. This recipe is great as an accompaniment for soups, salads, main dish meals, or breakfast! Here’s a close up so you can see the whole wheat grains in Buttermilk Wheat Bread. I make this bread using all wheat flour and adding honey and molasses (see recipe below). 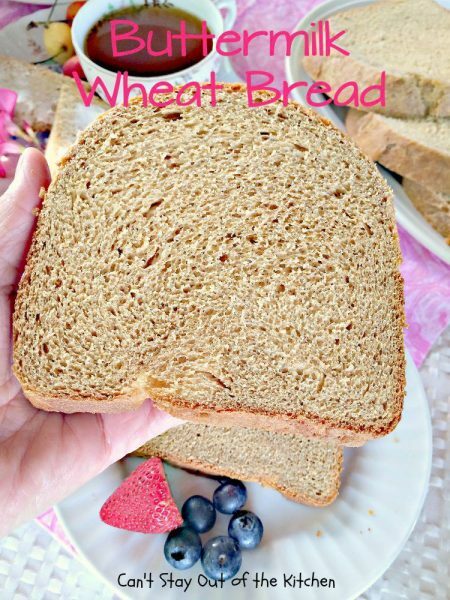 But you have to add 4 teaspoons vital wheat gluten with the yeast in order for the bread to raise decently when it is composed of that much whole wheat flour. 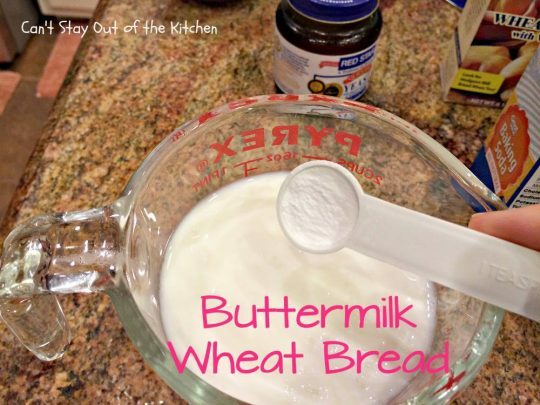 These are the ingredients I used to make Buttermilk Wheat Bread. I didn’t have any buttermilk on hand so I soured my own. Measure milk in a measuring glass. Add a couple of tablespoons of vinegar and allow milk to sit out on the counter for about five minutes. The milk should be soured by then. Now add a teaspoon of baking soda to the buttermilk/soured milk to activate. Pour mixture into bread canister. Add shortening. For those opposed to hydrogenated oils you can use butter or canola oil with good effects. Add honey, molasses, sugar and salt. Add whole wheat flour, yeast and vital wheat gluten. You will have to add vital wheat gluten for recipes with whole wheat flour to get the bread to raise. Otherwise, you end up with a very dense loaf of bread – similar to the Ellie Mae Clampett bricks from The Beverly Hillbillies! It really makes a big difference in the bread. Place the canister into the bread machine and set for a whole wheat loaf setting. This 2-lb. loaf takes approximately 3 1/2 hours to bake. Allow bread to cool in pan about 15 minutes before removing from canister. Butter the tops and sides of the bread with butter to prevent the crust from hardening. Allow the butter to soak into the bread for a few minutes before cutting down loaf. Ideally, you should wait about 30 minutes before cutting the bread. Slice down the loaf. I use an electric knife which works wonderfully for homemade bread. It cuts nice even slices–unlike sawing through the bread with a serrated knife which can really tear up a loaf of bread. This close up allows you to see the texture of the bread a little better. Now you sit back and enjoy a slice with a little butter on it! 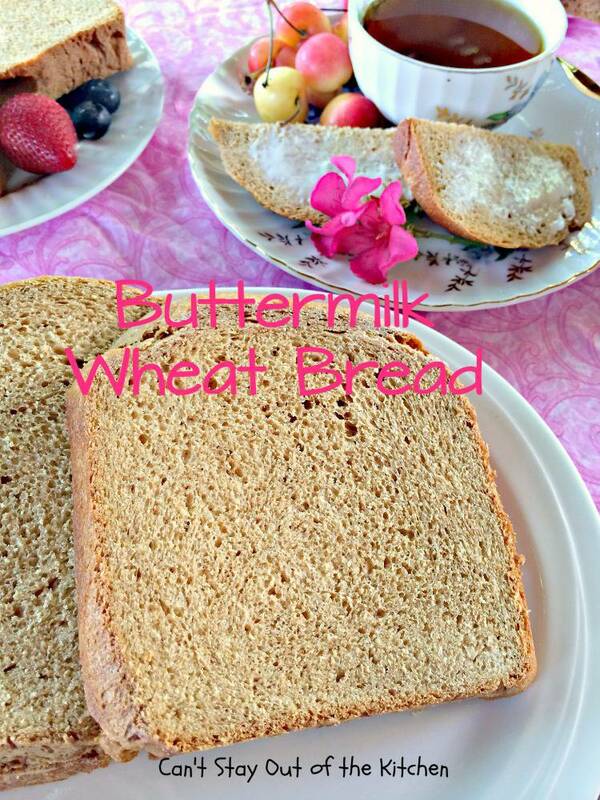 Buttermilk Wheat Bread goes great with any meal. I’ve added the vital wheat gluten to the original recipe because it makes such a BIG difference. Special thanks for my friend, Ron Pownall, in Black Mountain, North Carolina, for this tip. It truly helps the bread raise the way it should. 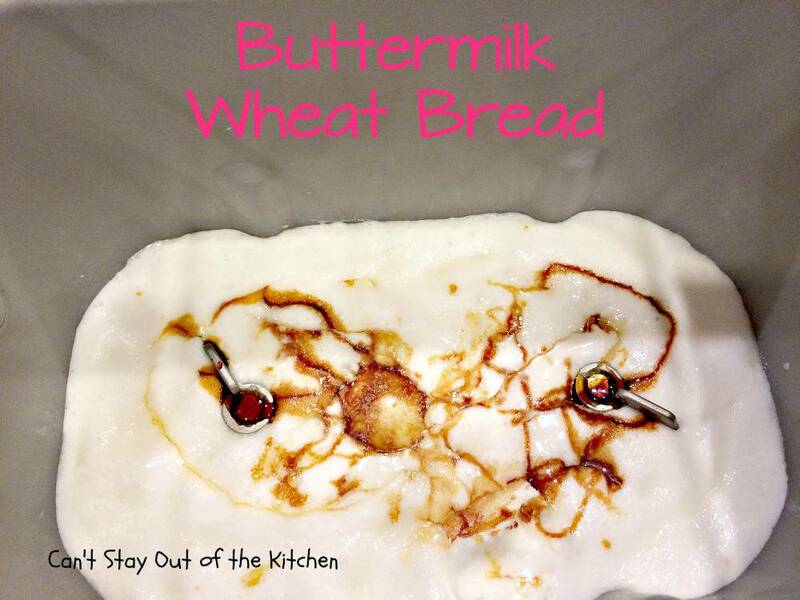 Delicious dinner bread made in the breadmaker using whole wheat flour with a recipe for homemade buttermilk (sour milk). This recipe makes a 2-lb. loaf. Buttermilk Wheat Bread rises so well because of the addition of Vital Wheat Gluten. Measure ingredients in the order listed into the Bread Maker Baking pan. Time for baking 4 hours 10 minutes. When finished remove from breadmaker with oven mitts. Remove bread from pan (making sure to get paddle out of the bottom if it comes out. Butter top and sides of bread. Let cool completely before wrapping in foil. 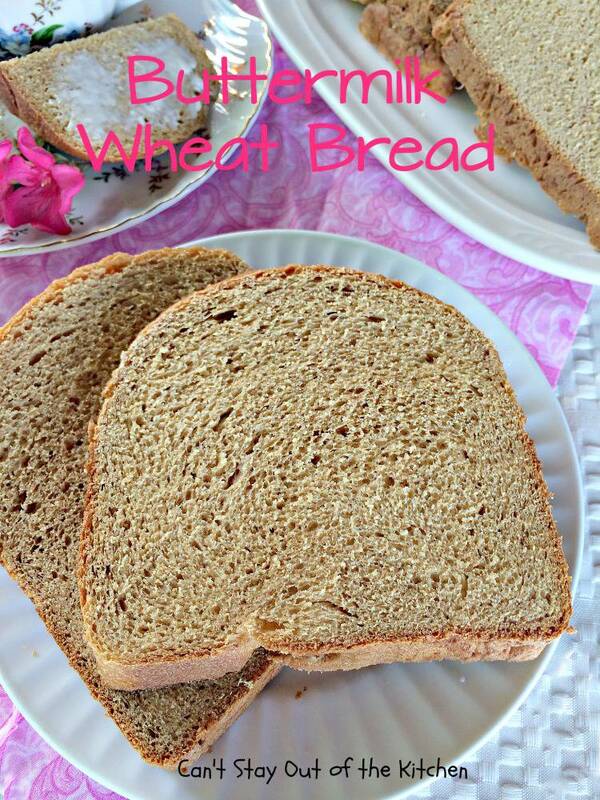 NOTE: Vital wheat gluten is an essential ingredient to get truly whole wheat bread to raise properly. Most whole wheat breads use only partially whole wheat flour and the remainder is bread flour. 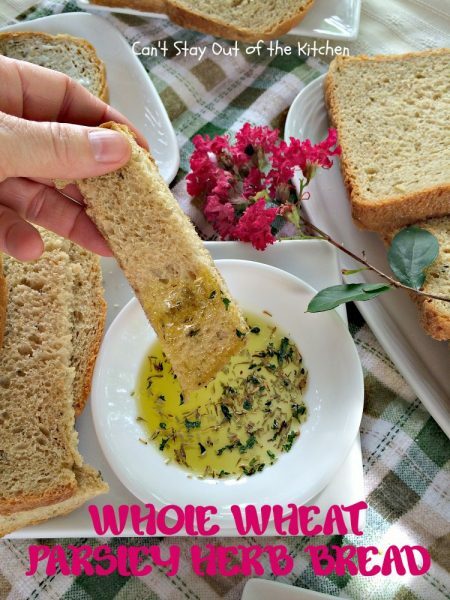 I prefer using vital wheat gluten any time I use any flour other than bread flour. NOTE: Homemade bread has no preservatives so it needs to be refrigerated after 2 days. Vital wheat gluten is an essential ingredient to get truly whole wheat bread to raise properly. 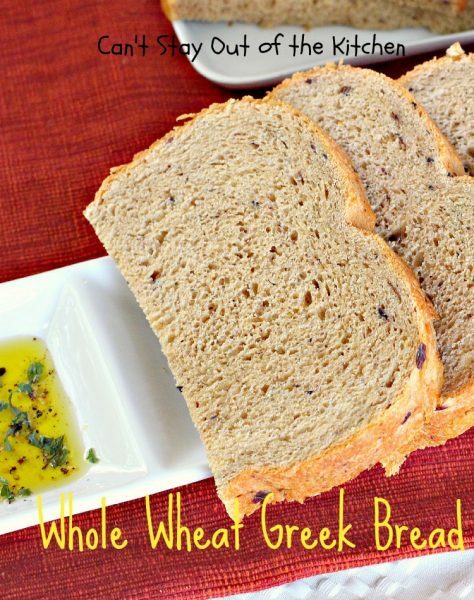 Most whole wheat breads use only partially whole wheat flour and the remainder is bread flour. I prefer using vital wheat gluten any time I use any flour other than bread flour. Doesn’t this look wonderful? This loaf came out nice and light because I added the vital wheat gluten to the recipe. Bread maker recipes are so easy to throw together. You can have a wonderful tasting loaf of bread in a few hours and meanwhile, go on to fixing other parts of your meal. This dinner bread is great to serve with hearty soups and chowders, but I served it with Party Casserole a delicious chicken dish with zucchini, baby carrots and pearl onions.